When home-based business owners think about ways to market their businesses, thoughts of social media, Facebook ads, email marketing, blogging, and SEO come to mind. While there's no doubt that these methods work, sometimes business owners need to think outside the box for new ways to break through all of the online noise. One way to stand out is through a direct mail campaign. With direct mail, not only do you break through the digital noise, but you also end up directly in the hands of your intended recipient. With the right message, call-to-action, or offer, you may even see higher returns on your marketing dollars. 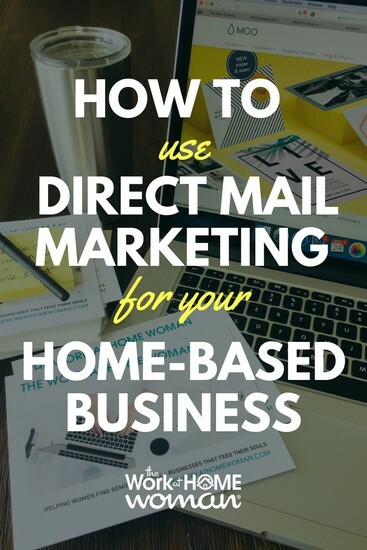 Here are five different ways you can use direct mail marketing to promote your home-based business. Have you tried cold calling or email prospecting as a way to get new clients? If so, you know how difficult it is to get anybody to reply to your queries. With caller ID and the popularity of text messaging, nobody answers their phones anymore. And with email, you're competing with a ton of other messages. If you work in a B2B field like graphic design, copywriting, or virtual assistance and you want to build your client base, direct mail may be the perfect medium to introduce yourself to potential prospects. Start by creating a list of your dream clients, find their physical address, and create a compelling postcard about your services. Remember to create an attention-grabbing headline, state the benefits of your services, and don't forget a call-to-action. In fact, according to Data Targeting Solutions, the response rate for a direct mail campaign is 2.9 percent which is much higher than email, social media, and display ads. You probably spend a great deal of time on new client acquisition, but how often do you nurture your relationships with past customers and clients? 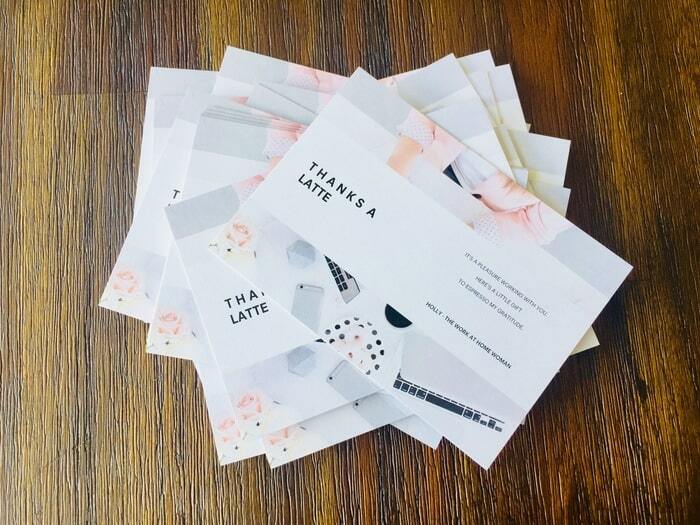 Thank you cards are the perfect way to show appreciation and stay in the forefront of their minds. First, you'll need to determine the appropriate time and occasion for sending a thank you message. It could be after the first sale, one year of working together, when they sign a contract, or when they spend a specific dollar amount. I like to send a thank you note after a big campaign or project has been completed. It's such a great way to end a campaign on a positive note. Figure out what time frame and occasion works best for your business model. Consider personalizing your message, as it can be more effective than a generalized “thanks for your business” greeting. Also, get creative. Last year, I had a client send me a thank you postcard with a candy-gram message that included, yup, candy bars. Find a pun-friendly candy bar and match it with the appropriate thank you message — it's such a fun and sweet way to say thanks, and best of all, it's memorable. A great way to entice new clients and engage old ones is to send out a direct mailer with a discount code or coupon. Not sure who you'd send them to? Use a service like EDDM, which is Every Door Direct Mail by the USPS. With this tool, you can target customers by location, postal route, residential or business location, age, household size, and income. Be sure to make your coupon time sensitive, including the coupon code, and pertinent information like a website, email address, and phone number. Remember the days when you would receive a handwritten invitation for a party or an event? Nowadays everything is in a digital format, from Facebook Events, Evite, and Punchbowl, to plain old text messages. To give your event or party some pizzazz, try sending out a direct mail invite. Not only will your invite stand, but it also won't get lost among the other online invites, and your recipient will have a physical, visual reminder which may help to increase your event's turnout. The holidays are a great time to send out notes of gratitude and appreciation. While you can offer discounts, words of thanks, and holiday cheer, some companies are showing their philanthropic side by making donations made in their customers' names. Another business I frequent, sent out a holiday postcard with a free session for a friend (what a great way to spread the word beyond your current customers)! You'll want to be sure to choose a high-quality print company, like MOO. You want your final product to come off looking professional, and when you choose just any old print company, the quality of the templates, paper, and imaging can be less than desirable. With MOO, they make it easy to create beautiful, professionally crafted business cards, postcards, flyers, stationery, and other promotional materials that’ll help your business stand out from the crowd. Once you figure out the goal and occasion for your campaign, you can start creating your direct mail piece. Don't worry if you're not the creative type, MOO makes it so easy to create professional looking marketing materials, no matter the occasion or goal. With their customizable templates for direct mail, business cards, sales vouchers, coupon codes, thank you notes, and more — you'll end up with a stunning piece that's sure to grab your client's attention. I recently created some Super Postcards with MOO, and I love how they use high-quality paper (18-19pt) so that you know your postcard will make it through the mail intact, looking great. They also use a soft touch finish, so your postcard is glare-free, and the colors look natural. In fact, the finish on these is unlike anything I've ever seen before — it’s super silky soft. You can also give your postcards an added bit of distinction, by choosing their Luxe Product Line which is super thick (32 pt) paper and comes with a colored seam. After you print your postcards and mail them out, you'll want to track the effectiveness of your campaign. Here are a couple of ways you can do this. If you're sending out a coupon code, be sure to create a unique code that identifies the campaign. Then merely track the number of times the code was used compared to how many mailers you sent out. With an introduction mailer, you can create a spreadsheet of dream clients that your message was sent to and then keep track of how many responses you receive. You may even want to consider sending a sequence of direct mail postcards which boosts your odds of being seen by the right person. If you're looking for a unique way to stand out from your competition, going offline can be an excellent way to do so. Not only are direct mail campaigns affordable and straightforward to put together, but they're also highly effective in generating new leads and reviving old ones. 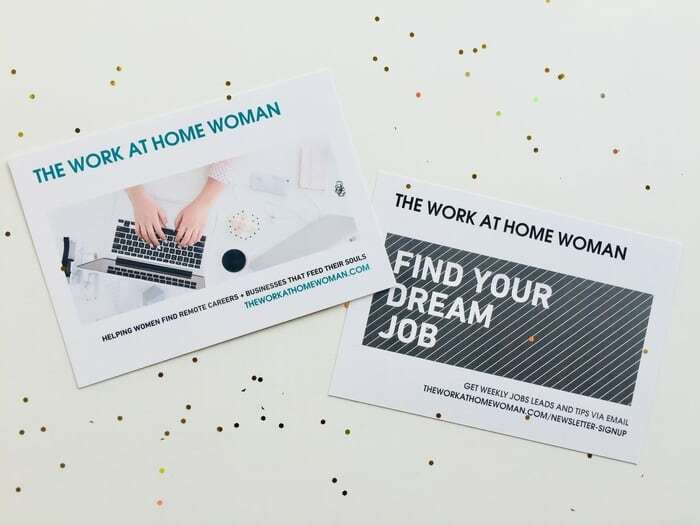 To help you get started with your direct mail campaign, MOO is offering readers of The Work at Home Woman an exclusive discount. Just use the promo code WHWANDMOO at checkout, and you'll receive 20% off MOO Postcards and Flyers for new customers only. In fact, MOO just came out with five new unique postcard sizes and the new Super premium paper which will make your campaign stand out even more. Have you tried boosting your promotional efforts with a direct mail marketing campaign? Do you plan to use the MOO discount and try a direct mail campaign yourself? Drop us a note; we'd love to hear from you! MOO sponsored this post. Please be aware we only promote advertising from companies that we feel we can legitimately recommend to our readers. See our disclosure policy for further information.